Welcome to our resources page where we offer an array of informative articles, lectures, presentations, studies, bookmarks and video clips to help convince your veterinarian – and everyone you know — to Fix your Feline before Five Months. These resources fall into several categories, though some of the resources cover two or more of the reasons to fix by five months. Read and download each to arm yourself with information when discussing with your veterinarian. For a great all-in-one resource, download Countering the Pushback To Spay. If you would like more information from Marian’s Dream, please don’t hesitate to contact us. Select one of the tabs below to view the associated resources. Recent research has revealed that cats spayed before their first heat cycle have a 91% lower risk of developing mammary cancer. The morbidity and mortality of feline and canine mammary gland cancer are so great that it takes the lives of an estimated 75,000 cats every year. Early spaying can help eliminate the risk of pyometria. “Association Between Ovariohysterectomy and Feline Mammary Carcinoma” authors: Beth Overly, Frances S. Shofer, Michael H. Goldschmidt, Dave Sherer and Karin U. Sorenmo, Journal of Veterinary Intern Medicine, 2005; 19:560-56. Hayes HM Jr, Milne KL, Mandell CP. “Epidemiological features of feline mammary carcinoma.” Vet Rec 1981;108:476-479. Misdorp W. “Progestagens and mammary tumors in dogs and cats.” Acta Endocrinol (Copenh) 1991;125 Suppl 1:27-31. Spaying/neutering generally results in the following behavioral changes: reduces roaming behaviors, aggression, territorial marking, howling and other heat-related behaviors and is therefore useful in keeping cats in homes. Over 80% of cats relinquished to shelters or abandoned are unspayed or unneutered. If they are being relinquished due to “bad behavior,” the number of shelter animals can be significantly reduced, along with the number of unnecessary eunthansias. Patronek GJ, Glickman LT, Beck AM, McCabe GP, & Ecker C (1996). Risk factors for relinquishment of cats to an animal shelter. J. Am. Vet. Med. Assoc.209 (3): 584. “More than 10 million kittens and puppies are born in the United States each year to female pets that are eventually sterilized. Reducing the number of these “pre-sterilization litters” by only 35% would stabilize the size of the household dog and cat population by bringing their birthrate into balance with the death rate.” – Peter Marsh, Esq. 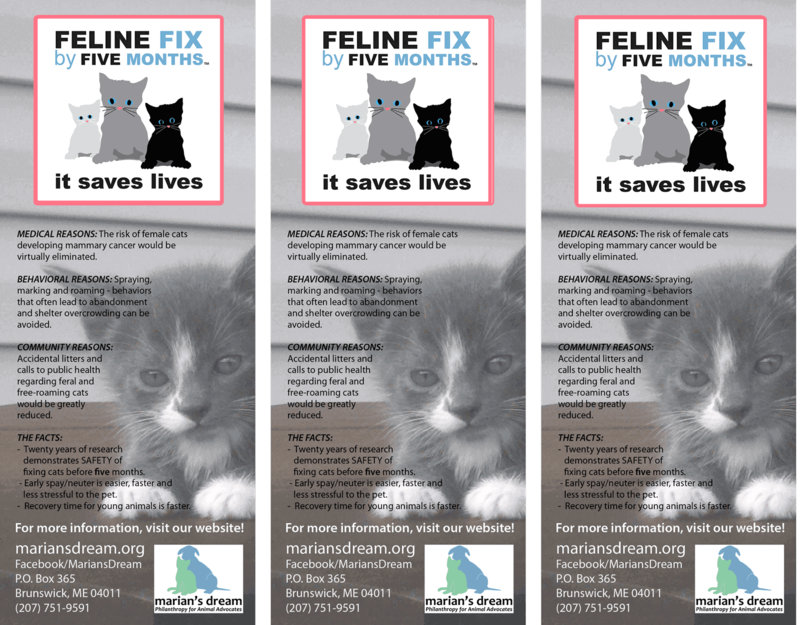 Spaying eliminates the possibility of unwanted litters; each year millions of surplus kittens are born who may or may not find a permanent home. Shelters are inundated with kittens, and older cats who may have found homes are often passed over. Cat complaint calls are at or near the top of the list of complaint calls to public health and/or animal control departments. And there are millions of feral cats, the result of people abandoning cats often due to preventable behavioral problems and unwanted litters. Juvenile spays/neuters are quicker and easier to perform than surgeries on cats that are in heat or pregnant. Spayed animals are more likely to remain in your client’s home – intact animals enter shelters at rates two to three times that of sterilized animals. And your client will thank you for preventing mammary gland cancer – which kills about 75,000 cats annually. For more in-depth information to make a really strong case to your veterinarian, download Dr. Richard Speck’s comprehensive study/ presentation on early spay here. We are pleased to let you know that Today’s Veterinary Practice, a popular veterinary magazine, has published Dr. Richard Speck’s article, ‘The Case for Neutering at Five Months of Age’ in the November/December 2014 issue. Please feel free to print and bring to your vet or share via email and on Facebook.